This page outlines who is involved in the process of advocacy, the resources used for advocacy, and how you can get involved. 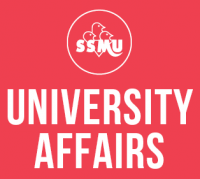 The SSMU University Affairs advocates for various topics of interest to students, such as improvement to Student Services, academic policy changes, equity and Indigenous affairs, harm reduction, and improvements to teaching and learning, among other things. A lot of advocacy work also involves holding the University accountable to its own commitments and policies. This is done via multiple channels across the University, be it in the McGill Senate, various university committees, the faculty associations, and many meetings with Administrators and other members of the University community. The reality is that students across the university are engaged in advocacy—whether in their own classes, as part of a student group, or in a formal representative role. However, the SSMU University Affairs portfolio coordinates resources for the following individuals. Every undergraduate student is represented by a Senator based on their faculty affiliation. Senators can relay their constituents’ concern to Senate, McGill Admin, the Faculty Association, or University-level committees. In McGill Senate, Senators can submit questions to McGill Admin to ask for information regarding the University’s stance or plan on a certain issue, or bring important issues to the attention of the McGill Administration. This is a great way to raise awareness and advance advocacy efforts about pertinent topics to student life as well as to keep the University accountable and transparent. All Senate questions and responses are available online in the Senate Archives, or scroll below to the “Advocacy Resources” section to see all past Senate Questions submitted by SSMU Senators. Most initiatives at the University begin in various committees. Therefore, a lot of advocacy work happens at this level: to create new initiatives, plan and organize them, as well as monitor and evaluate them. There is a complex chain of command of University Committees, 48 of which have undergraduate representation. Each committee has a specific scope of work, and there are committees for just about anything, ranging from advising, Student Services, equity, to classroom improvements. View the list of University committees and the reps’ emails here, and get in touch with the reps in the committee related to the issue you are interested in. Read the “Get Involved” section below to learn more about how you can get involved in advocacy efforts in the University. In order to effectively advocate for various causes, the SSMU has a range of resources available in the form of reports with which students can learn more about the issues and their backgrounds. The SSMU maintains an archive of many important meeting minutes, documents and reports from various groups within SSMU itself, as well as from McGill Committees and Senate. We may also be able to refer you to relevant information available on the University website that might help your advocacy efforts. Contact the University Affairs Secretary General to inquire more about the archives. Other than that, below is a list of other sources of information that might be helpful for advocacy. Check the SSMU University Affairs Blog for updates that might relate to your issue of interest! (Hint: Use the tags in order to navigate by subject, for example, “Libraries”). The SSMU University Affairs portfolio commissions research on various topics in support of its advocacy efforts. The reports can be viewed here. You can also request or suggest new research topics to support your advocacy efforts via this online form. They will then refer you to relevant materials, or work with you to commission a new research project based on your proposal. For more information, contact the Policy and Advocacy Research Commissioner. Undergraduate representatives sitting on various McGill Committees must submit a report at the end of every term, which contain useful information about the work that takes place in the committees. Click below to read the reports. Click below to see a list of Senate Questions (with responses) that were submitted by SSMU Senators in the past few years. Senate documents (including questions) are archived on the McGill Senate’s Archive page. As a resident of Quebec, you have the right to request any document from McGill University, as per the Act Respecting Access to Documents Held by Public Bodies and the Protection of Personal Information. Access to Information Requests (ATIs) can be a useful means to obtain information from the university that is in the public domain but not easily shared. You can find more information on how to submit an ATI here. The SSMU Know Your Rights website exists as an intuitive resource on McGill policies. This site is a great starting point for any questions about student assessment, accommodation, and other needs. • Join a SSMU Committee: The University Affairs Committee (UAC) which helps the UA portfolio with various initiatives, such as the Know Your Rights campaign (email the VP University Affairs for more information). Other than that, SSMU also does a lot of advocacy in the student body through its committees, such as the Committees on Affaires Francophones, Environment, Equity, and Mental Health. To see a complete list of SSMU committees and who to contact, click here. • Join a McGill Committee: We recruit students to sit on undergraduate representative spots on various University-level committees every March and August for the following academic year. The callout will be posted here on the website, our social media outlets, as well as various listservs. • Volunteer for a Student Group: Many of SSMU’s affiliated student groups also serve an advocacy role, such as Queer McGill (QM), the Union for Gender Empowerment (UGE), the Black Students’ Network (BSN), the Sexual Assault Centre of the McGill Students’ Society (SACOMSS), and the Quebec Public Interest Research Group (QPIRG). Check out the list of active student groups to find one that interests you. • Get involved with your association: Nearly every academic program at McGill has an association that is responsible for planning events, providing resources, and advocating at the local level. You can volunteer for their events, sit on a committee, or run for an executive position. Contact your association to to learn more! • Run for Senator: Senator elections are mostly done at the faculty level during the months of February and March for the following academic year. To learn how to run for a Senator position, contact your Faculty Association or the VP University Affairs. Follow us on Facebook and Twitter, and subscribe to our monthly listserv to stay informed about our latest advocacy efforts and how you can participate. If you have any questions, feel free to contact the Vice-President (University Affairs) or drop by their office hours. The VP UA can help you address your concerns or refer you to the people who are best suited to help.